The second in the Steinbach Christmas Carol Series, this 17-Inch Steinbach Bob Cratchit with Tiny Tim Nutcracker is a limited edition item of 7,500 pieces. The poor-yet-happy Bob Cratchit, dressed in a green coat and a tan top hat and pants, is not only carrying home festive Christmas wreaths, he is carrying his most precious cargo, his sickly son Tiny Tim, perched on his shoulder. 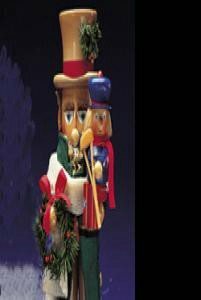 Though they do not have much, these two characters are the epitome of Christmas spirit, cheer, and warmth--and it is clearly shown in this beautiful nutcracker. Like all of Steinbach's creations, Bob Cratchit with Tiny Tim is lovingly crafted with the finest care and attention to detail.